Michelle Parkerson is a native Washingtonian. 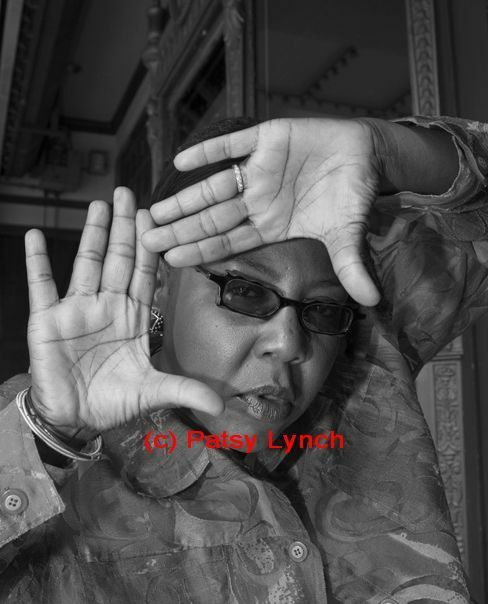 For more than three decades, Michelle Parkerson has been at the center of African American lesbian and gay activism, black women making films, lesbians making films, poets performing, performance artists entertaining and challenging, preserving and promoting the lives of primary voices in her and our experience. Recently she herself has appeared as one of those primary voices in a film not of her making, Tiona McClodden’s Black.Womyn. : Conversations with Lesbians of African Descent (2008). As she says of film and video, she puts a face on things. In the late1970s, she explored the vibrant club scene in DC and began building a network of connections. This was a time of incredible artistic and political ferment in Washington’s African American gay and lesbian circles. Artists, musicians, poets, dramatists, and writers were creating a new black gay renaissance in the city that flourished in places like dc space and the ENIKAlley Coffeehouse. In short order, she had connected with E. Ethelbert Miller, Director of Howard University’s Afro-American Resource Center and soon she was presenting and performing her own poetry. She published in the brand new gay periodical,BlackLight, and in the early feminist newspaper, off our backs. Through her growing network of connections she met Essex Hemphill and other members of Station to Station, a gay male performance group that included Gideon Ferebee, Greg Ford, Garth Tate, Christopher Prince, Larry Duckette and others whose names became well-known in the 1980s. Michelle appeared with Essex Hemphill and Wayson Jones in many performance pieces of the 1980s, including Murder on Glass and Voicescapes: an urbanmouthpiece. In 1983, she published Waiting Rooms, her first book of poetry and short fiction (Common Ground Press). As late as 1997, she partnered with poet Gideon Ferebee in Behind Our Masks at the first Mid-Atlantic GLBT Writers Conference in Washington. Michelle focused on performance collaborations with African American women and other progressive artists during the 1990s. Among them: DIVAS…An Evening with Michelle Parkerson and Brenda Files, The Dangerous Bordergamewith Guillermo Gomez-Pena, The Rainbow Room with Djola Branner and Women of Substance with Kimberli Boyd and Kwelismith. Michelle engaged fully in the African American gay and lesbian political activism of the 1980s, joining the new DC Coalition of Black Gays and Lesbians and the National Coalition of Black Lesbians and Gays ( NCBLG). Gil Gerald, Executive Director of NCBLG, invited her to join the organization’s board. By 1987, she was co-chair of NCBLG with Baltimore activist, Louis Hughes, as it worked to build a network of chapters around the country. Through the mid-80s she was part of NCBLG’s campaign to raise the visibility and the voice of African American gays and lesbians. Michelle’s activism and her art worked toward identical goals of creating awareness and independence, pride and self reliance and a fierce opposition to racism, sexism, and homophobia. At the same time, she became a central figure in the city’s first social and support organization for African American lesbians, the Sapphire Sapphos, which met at the ENIKAlley Coffeehouse. Through the 1980s, Michelle’s career in film-making took off with three important documentaries giving visibility and voice to major figures such as idiosyncratic jazz stylist Betty Carter (But Then, She’s Betty Carter, 1980), Washington’s Sweet Honey in the Rock (Gotta Make This Journey: Sweet Honey in the Rock, 1983), and her exploration of the life and career of an early drag king (Stormé: The Lady of the Jewel Box, 1987). Nearly a decade later her film biography of poet Audre Lorde (A Litany for Survival: The Life and Work of Audre Lorde, 1995), co-directed with Ada Gay Griffin, was nominated for the Grand Jury Prize at the Sundance Film Festival. In recent years, Michelle has divided her time between DC where she has a home and Philadelphia where she was Assistant Professor in Film and Media Arts at her alma mater, Temple University. She is currently in development with her first feature screenplay, Loving Eunice, a coming-of-age story sparked by lesbian love during the Harlem Renaissance.